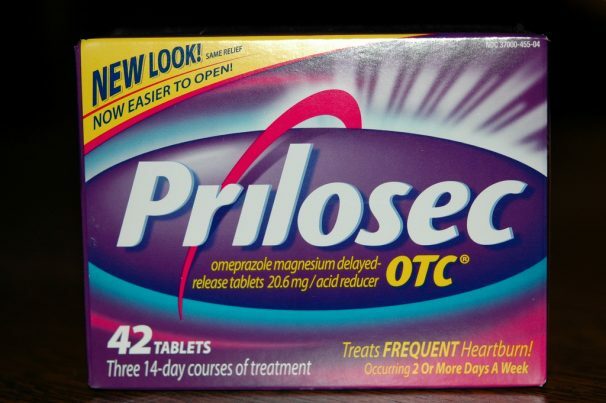 Omeprazole is a proton pump inhibitor (PPI) drug used to treat heartburn, a damaged esophagus, stomach ulcers, gastroesophageal reflux disease (GERD), and conditions that cause the stomach to produce too much acid. It works by reducing the amount of acid made by the stomach. Omeprazole is also sometimes used in combination with antibiotics to treat ulcers associated with the infection caused by the Helicobacter pylori bacteria. It is also used to treat Zollinger-Ellison syndrome and dyspepsia. The drug is also used to prevent upper gastrointestinal tract bleeding in severely ill patients. Omeprazole should not be used by people who are allergic to omeprazole or similar drugs. Intake of this drug may also cause problems if you are pregnant or breastfeeding, or if you have kidney disease, liver disease, lupus, or osteoporosis. Omeprazole should also not be used if you are using other medicines that contain rilpivirine. It may also interact with prescription and non-prescription medicines like Benzodiazepine medicine, a blood thinner, diuretic, iron supplements, and a lot more. Omeprazole is sold in the brand name Prilosec. Bone fractures: People who take doses of omeprazole or other PPI drug every day for one year or more may have a greater risk of bone fractures in the hip, wrist, or spine. Magnesium deficiency: Taking omeprazole for three months or more can also deplete magnesium levels in the body. The risk is higher in people taking the drug for a year or longer. Severe diarrhea: omeprazole may raise the risk of severe diarrhea, which may be due to an infection in the intestine caused by Clostridium difficile bacteria. The body systems that may be harmed by omeprazole include the nervous, gastrointestinal, respiratory, dermatologic, psychiatric, musculoskeletal, hepatic, cardiovascular, and hematologic systems. Omeprazole is a proton pump inhibitor (PPI) drug used to treat heartburn, a damaged esophagus, stomach ulcers, gastroesophageal reflux disease (GERD), and conditions that cause the stomach to produce too much acid. Omeprazole works by reducing the amount of acid made by the stomach. Omeprazole commonly causes constipation, gas, headache, nausea, and vomiting. Omeprazole can also cause severe diarrhea, magnesium deficiency, and bone fractures.